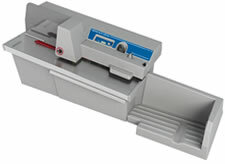 The Omation 2112 Envelopener offers proven technology for mid-sized letter-opening jobs. This compact unit provides mailroom automation for mid-volumes of incoming mail, and it is equipped with the same milling cutter technology as the higher speed Omation 306 Envelopener. With thousands of Omation envelopeners installed throughout businesses and governmental agencies, the 2112 delivers an economical solution for automated envelope opening. By using the same unique high-speed Omation letter opener as Omation’s larger Envelopener, the Model 306, the Omation 2112 prevents sliced contents and produces a soft, feathered edge. This is a distinct advantage over slicing-blade and guillotine-type cutters that often damage contents and leave sharp edges, which cause painful paper cuts. Waste is minimized, because the Omation Model 2112 produces tiny milled chips rather than larger strip cuttings. The chips are whisked away and automatically discarded into a large capacity chip tray, keeping the workspace clean and preventing jams.